4 Comments on SASSY’S BOOK BLOG MEME: What’s on Your Desk Wednesday? What’s on your desk Wednesday? is a weekly bookish meme hosted by Sassy Brit of Alternative-Read.com . 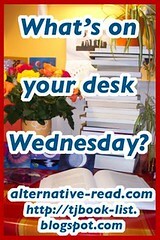 Check my blog out each Wednesday for the new post titled What’s on your desk Wednesday? Stack of author promotions to send out. A mini zen garden. I keep spilling this all over my desk! Thanks again for tagging me! This is a fun meme. I was tagged by Donna, and just added my post via Mr. Linky. Previous Entry SASSY’S BOOK BLOG MEME: What’s on Your Desk Wednesday? GUIDELINES!